Home > FAQs > Quotes and Orders > Where can I get a cheap French translation? I need some pages on my website translated into French as cheaply as possible. Were can I get a cheap and good French translation. Can I get one from you? Waiting for your answer. ‘Where can I get a cheap French translation‘ is a question we’re asked on an almost daily basis so thank you for giving me the opportunity to answer it. Before I go into detail on your specific question I think it’s important that we discuss what exactly is meant by the term ‘cheap French translation’ as the answer is not as simple as many people think, so here goes. What is a cheap French translation? As I’ve discussed in other articles, how much a translation costs depends on on many factors. However to keep things simple, let’s just assume that you are being charged on a per thousand words of source document basis. So, to compare prices and work out which is the cheapest, you’d simply look at the per thousand words figure. The cheapest French translation would be from the company offering the lowest price. Simple – or is it? The problem is, whatever the price you are quoted, it’s not going to be the absolute cheapest possible price because you could use one of the free online translation tools. In which case the price would be zero. Of course, as anyone who has tried these types of tool will testify, the quality is usually awful. There are usually other limitations as well such has how much text can be translated in one go and loss of formatting. The French translation itself might be free, but you’d have to waste a great deal of time cutting and pasting at your computer to get it and you can never be sure the translation is accurate even if you attempt to do a back translation on it. The problems with buying entirely on price from a company are very similar. Using a company may take away some of the hassle but you still have no idea whether or not the translation will be accurate so there is a very real risk. We receive dozens of applications for jobs as translators every week and end up hiring less than one percent of them. The reason is most of them think they are translators just because they can speak a second language. They are not. There is much more to being a professional translator than most people realise. In short, they are not good enough to work for us as they are not good enough to work on your translation projects. We do not wish to be rude about our competitors but someone out there must be hiring them, and that’s scary. Most discussions about the price of translation focus on how much a company charges per thousand words and assume that the finished translation will be fit for purpose. What most people fail to realise is the cost of getting it wrong. Here’s what I mean by way of example. We are often contacted by prospects who have spent several thousands of pounds – or in some cases, several tens of thousands of pounds on a new website and who want a quote to translate it into French (or any other language, but I’m using French as the example). When we ask them what’s important to them, they say that they are simply looking for the cheapest quote. They assume that translations are commodities and the only thing which differentiates one company from another is price. This is simply not the case and it’s dangerous to assume it is for, as the customer, you often have no way of telling how good the translation is. If the translation is bad, you could very well end up losing business when prospects in your target market land on your site and see a poor quality translation. Would you buy from a website where the sales copy is full of mistakes and looks like it’s been written by someone who can’t speak English very well? I know I wouldn’t. The sad thing is, as a percentage of the overall web creation project, the cost of the translation is modest and the incremental cost of using a quality translation company who will produce an effective translation (or even a transcreation) which will get the results you are hoping for is tiny. What is ‘good’ also depends on why you need your French translation. If you have a non-critical document and you’d just like to get an idea of what it says (you never intend to publish it online or distribute it in print) then one of our Budget Translations would be perfect as they are produced professionally but offer excellent value. At the other end of the spectrum, if your project is critical to your business and the cost of getting it wrong is substantial then you may consider using our Business Critical Translations, with its industry-leading quality, to be the best solution. 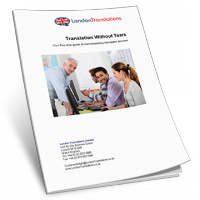 For most applications, our best selling Standard Business Translations are the right way to go as they represent a great deal and can be turned around very quickly. I hope this has answered your question, if you need more information please get in touch as we are always happy to help and make recommendations once we understand better what you are trying to achieve.